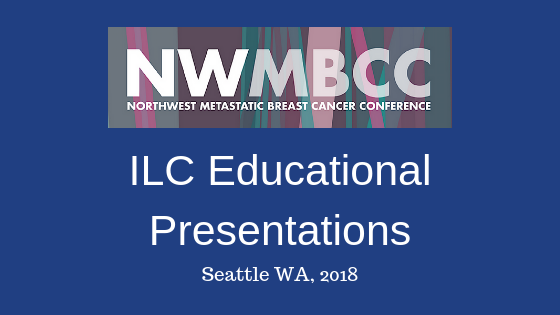 The 2018 Northwest Metastatic and Lobular Breast Cancer Conference (NWMBCC) was held October 26th and 27th in Seattle WA. 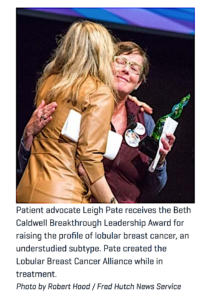 It included three patient-oriented educational sessions focused on Lobular Breast Cancer. Join Steffi Oesterreich, PhD, Hannah Linden, MD and moderator and LBCA Coordinator Leigh Pate to learn about Lobular Breast Cancer. Part 1: How is ILC different than ductal breast cancer, and what does it mean for me? This 45 minute session provides an overview of the basics of ILC and key differences in ILC from the more common ductal breast cancers. This 45 minute presentation identifies some of research studies in the lab that may lead to targeted therapies and current clinical trials and opportunities to refine treatment for ILC. The entire two-day conference can be viewed online and includes educational sessions that cover managing treatment side effects, New Strategies in Breast Cancer Treatment and presentations on promising research to understand breast cancer metastasis, immunotherapy as well as educational sessions on metastatic breast cancer by subtype and location of the disease. The conference also featured sessions on advocacy and how patients can become advocates, and included lobular advocacy. Learn more about how to become a patient advocate by watching this advocacy panel, and by reviewing the LBCA patient advocacy toolkit. LBCA thanks Susan G. Komen Puget Sound and the patient event steering committee for hosting this event and featuring lobular breast cancer in the content, and Steffi Oesterreich PhD and Hannah Linden MD for sharing their time and expertise to benefit patients with lobular breast cancer.